I started this analysis wondering if the percentage of jobs in professional, technical, and scientific industries in NH that are held by females is greater among younger workers in the industry than older workers. I became sidetracked by the unexpected finding that the percentage of workers in those industries is about evenly divided between men and women (and as a spoiler the percentage that is female is larger at younger age groups – consistent with my “‘feminization of the NH workforce” theme from an earlier post). One caveat before proclaiming gender equity in professional and scientific fields, the data do not account for the specific occupations in the industries. That is, it is possible that the conventional wisdom that women are less employed in those industries is not supported, but the fact may remain that the more professional, scientific, and technical occupations in those industries (as opposed to the management, support and other occupations) may still be dominated by males. Unfortunately there is data from different datasets that supports this thesis, although it does appear to be changing. 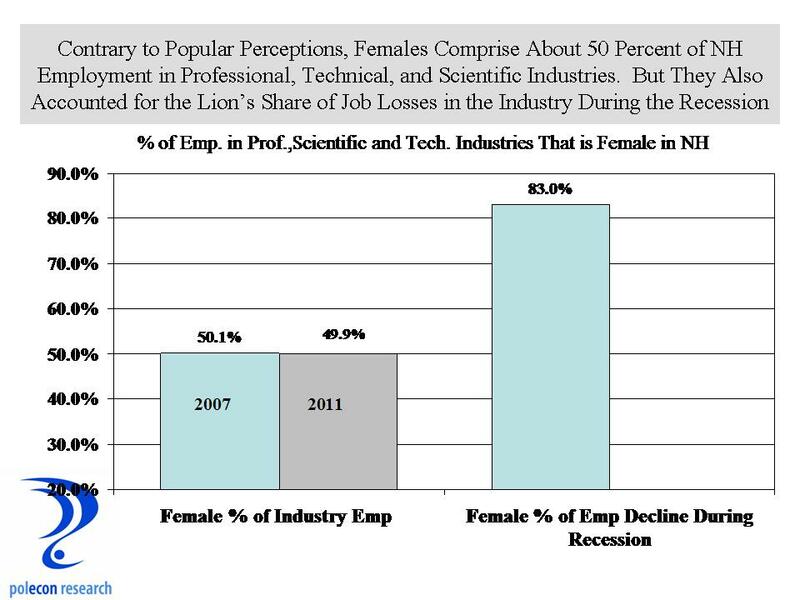 The chart below shows that women comprise about half of the employment in the broad industry grouping of professional, scientific, and technical industries. The real kicker in the data is that it shows that reductions in employment in those industries came largely at the expense of female workers. Again, this may just be a function of the reductions in those industries occurring in specific occupations more likely to be populated by females, a viable interpretation. It may also be related to an increase in female employment among younger and newer workers in the industry who’s employment may be most vulnerable in a recession. Nevertheless, such a high percentage of decline in those industries coming at the expense of female workers is well beyond what would be expected based on probability and chance alone. This entry was posted on November 26, 2012 at 12:50 pm and is filed under Gender, Unemployment. You can subscribe via RSS 2.0 feed to this post's comments.